Etched into the surviving art of the Moche, one of South America's most ancient and mysterious civilisations, is a fearsome creature dubbed the Decapitator. Also known as Ai Apaec, the octopus-type figure holds a knife in one hand and a severed head in the other in a graphic rendition of the human sacrifices the Moche practiced in northern Peru 1,500 years ago. For archaeologists, the horror here is not in Moche iconography, which you see in pottery and mural fragments, but in the hundreds of thousands of trenches scarring the landscape: a warren of man-made pillage. Gangs of looters, known as huaqueros, are ransacking Peru's heritage to illegally sell artefacts to collectors and tourists. "They come at night to explore the ruins and dig the holes," said Cuba Cruz de Metro, 58, a shopkeeper in the farming village of Galindo. "They don't know the history, they're just looking for bodies and for tombs. They're just looking for things to sell." A looting epidemic in Peru and other Latin American countries, notably Guatemala, has sounded alarm bells about the region's vanishing heritage. 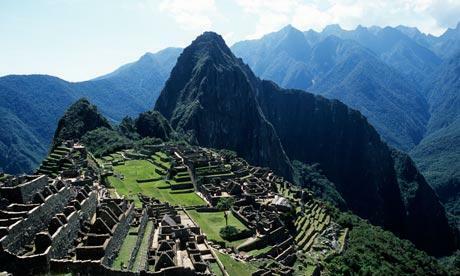 The issue is to come under renewed scrutiny in the run-up to July's 100th anniversary of the rediscovery of Machu Picchu, the Inca citadel in southern Peru, by US historian Hiram Bingham. He gave many artefacts to Yale university, prompting an acrimonious row with Peru's government which ended only this year when both sides agreed to establish a joint exhibition centre. A recent report, Saving our Vanishing Heritage, by the Global Heritage Fund in San Francisco, identified nearly 200 "at risk" sites in developing nations, with South and Central America prominent. Mirador, the cradle of Mayan civilisation in Guatemala, was being devastated, it said. "The entire Peten region has been sacked in the past 20 years and every year hundreds of archaeological sites are being destroyed by organised looting crews seeking Maya antiquities for sale on the international market." Northern Peru, home to the Moche civilisation which flourished from AD100-800, had been reduced to a "lunar landscape" by looter trenches across hundreds of miles. "An estimated 100,000 tombs – over half the country's known sites – have been looted," the report said. The sight breaks the heart of archaeologists and historians piecing together the story of a society which built canals and monumental pyramid-type structures, called huacas, and made intricate ceramics and jewellery. The Moche, who pre-dated the Incas by 1,000 years, also painted murals and friezes depicting warfare, ritual beheading, blood drinking and deities such as the Decapitator, who has bulging eyes and sharp teeth. Analysis of human remains confirmed that throat-cutting was all too real but, in the absence of written records, archaeology must shed light on what happened. In villages such as Galindo that is becoming all but impossible. Crude tunnels and caves make Moche ruins resemble rabbit warrens. Deep gashes cut into walls expose the brickwork below. Millennia-old adobe bricks are torn from the ground and scattered as though in a builder's yard. Most huaqueros are farmers supplementing meagre incomes. Montes de Oca, one of three police officers tasked with environmental protection in a region of a million people, said he was overwhelmed. "I've been doing this for 28 years. There are three of us and one truck. It's insufficient but we do everything possible." Ten miles away Huaca del Sol, one of the largest pyramids in pre-Columbus America, is an eroded, plundered shell. Here the culprits were not impoverished farmers but Spanish colonial authorities who authorised companies to mine for treasure, said Ricardo Gamarra, director of a 20-year-old conservation project. "They diverted the river to wash away two-thirds of the huaca and reveal its insides," he said. "They mined through the walls and caused it to collapse in various places. It's impossible to guess how much was taken because we don't know how much was there." Donations from businesses and foundations have helped Gamarra's team protect what is left, drawing 120,000 visitors each year, but of 250 other sites in the region just five have been protected. "In the mountains it's the same. It is full with archaeological sites, almost all of them have been destroyed," said Gamarra. There has been good news from Chotuna, also in northern Peru, where archaeologists found frescoes in a 1,100-year-old temple of the Lambayeque civilisation, which flourished around the same time as the Incas. Jeff Morgan, executive director of the Global Heritage Fund, urged Peru to funnel tourists away from Machu Picchu, overrun by two million visitors a year, to lesser known sites which could then earn revenue to protect their heritage. The government should resist the temptation to pocket the money. "One of the biggest problems is the disconnect between local communities and management of the sites. We think locals should get at least 30% of revenues." Only then, said Morgan, would cultural treasures fom the Moche and other civilisations be saved.